Why are puzzles useful as assessment tools? Puzzles, like word search puzzles, give educators a look into students' problem-solving abilities, knowledge of concepts, and strength and consolidation of vocabulary. 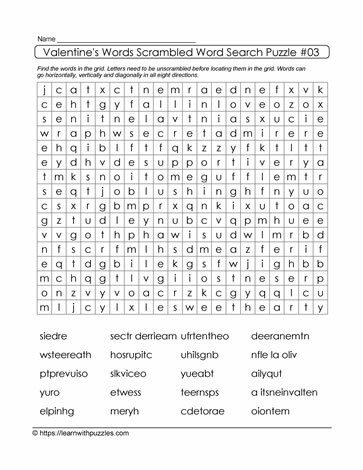 Use this Valentine's day themed word search puzzle, that uses scrambled letters in the word clues instead of the regular list of words, to assess students word attack skills, identify learning gaps, and help to inform instruction.